This is a sponsored conversation written by us on behalf of IHG Rewards Club. The opinions and text are all ours. We didn't expect to love Washington DC but if there's one thing we learned in our travels it is that anywhere can surprise you. 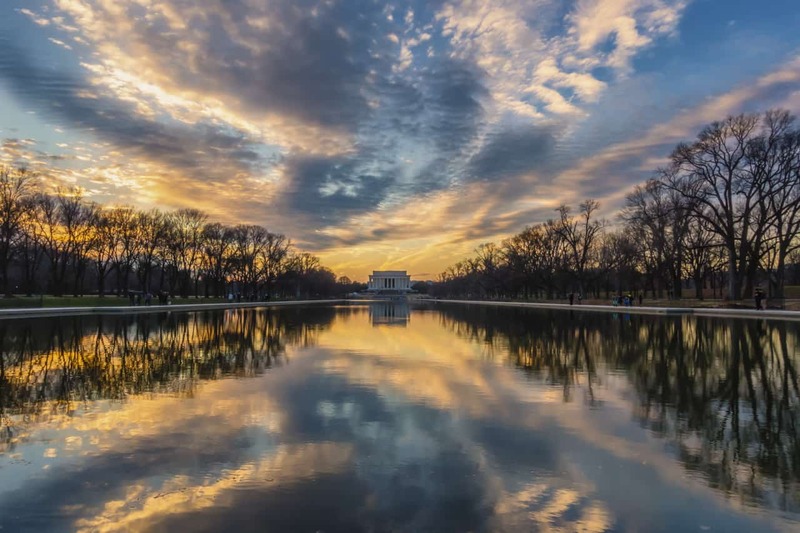 When IHG© Rewards Club asked us if we'd like to experience their Ambassador program in the new Intercontinental Washington D.C. Wharf we thought it was time to see America's capital city. 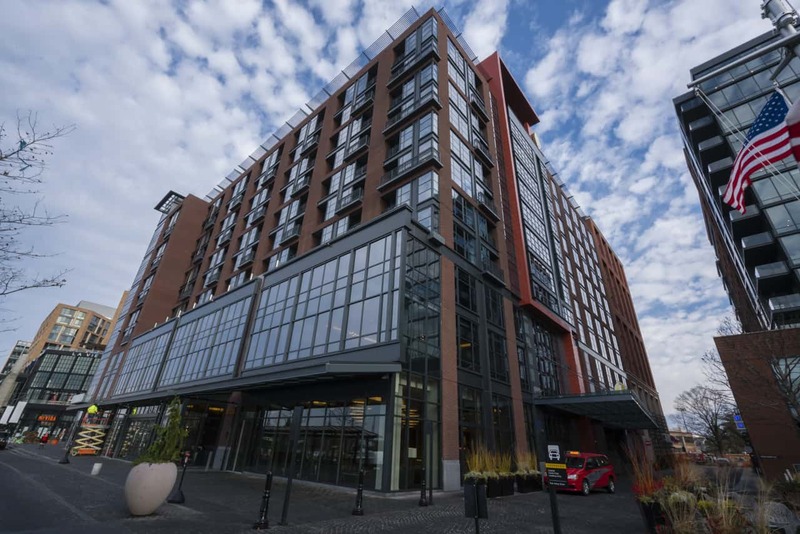 District Wharf is a brand new development walking distance from everywhere any tourist would want to visit in Washington D.C. And the gorgeous Intercontinental The Wharf makes for a great base when sightseeing. Did you know? IHG© has the largest rewards program in the world with hotels like InterContinental, Holiday Inn, Hotel Indigo, and Crowne Plaza. This was our first visit to D.C. and we knew we had very little time to see everything we wanted. Luckily the concierge at the Intercontinental Wharf was very helpful and laid out our route telling us where we should go and what we should see first. Everyone at the Wharf was helpful and genuinely excited to have us visit their city. They even got us tickets to the African American History and Cultural Museum when we told them in passing that we wanted to go. The next thing we knew, there were tickets waiting for us at the front desk!. Note: All museums in Washington D.C.'s Smithsonian are free, but the African American Cultural Museum is so busy, we needed to book tickets in advance. Something we didn't do before our arrival. A Walking Tour of Washington D.C.
We visited D.C. in December and learned that it is an excellent time to see the city. The government is in recess, most locals have gone home for the holidays and not too many tourists frequent Washington at this time of year. We had many places all to ourselves. Walking tour in Washington D.C.
What surprised us about Washington DC? Just how huge every monument is and just how close everything is together. Washington DC is the perfect walking city with plenty of picturesque trails and easy walking paths. The monuments, memorials and buildings are grand, and each one is laid out within close proximity to the next. It really is a beautiful city to explore on foot, and it's an easy and entertaining way to learn about American history. It was a short and pleasant walk along the waterfront past the water taxi that can take you easily to out of the way places like Arlington Cemetery and Georgetown. The Wharf is a new upcoming area and the Intercontinental is located right in the heart of it all. We ate at their popular Kith and Kin restaurant for both dinner and late night snacks. As our bartender told us, “When you visit once, you are instant friends (kith), but by the second visit you are family. (kin) and that is exactly how we felt. By our second visit for dinner, we felt like we had been regulars for years! This place is so popular you need to make sure to make reservations. 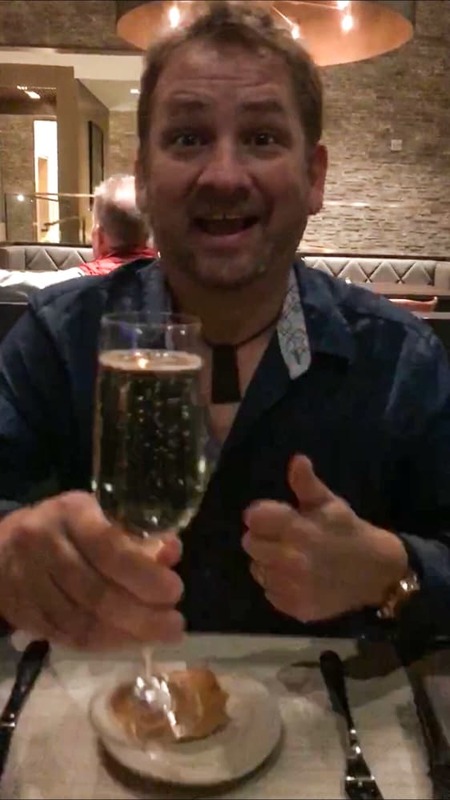 With our IHG© Rewards Club Ambassadors level we enjoyed a free welcome drink at the bar before retiring to our free upgraded room where we received a local gift, fresh fruit and water. Unlike many other rewards levels, IHG allows anyone to become an Ambassador. 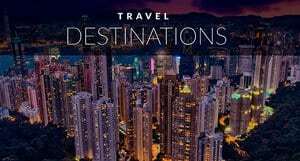 If you plan on traveling a lot you can purchase the Ambassador benefits for $200. It's worth it for early check in, late 4pm check out, complimentary room upgrades and one free weekend night's stay per year. Visit IHG© Rewards Club for the complete list of benefits. We walked through a charming outdoor market on our way to the memorials of DC. To give you an idea of just how easy it is to see everything in Washington, a walk around the entire Tidal Basin from the Intercontinental The Wharf will only take you about 45 minutes if you didn't stop. We stopped a lot, but it was only about 15 minutes before we found ourselves at our first stop, the Jefferson Memorial. Located on the South Bank, this stunning memorial was modelled after the Pantheon of Rome. Dave and I both agreed that the Jefferson Memorial was our favourite in the city. It sits farther away from the other monuments overlooking the basin. 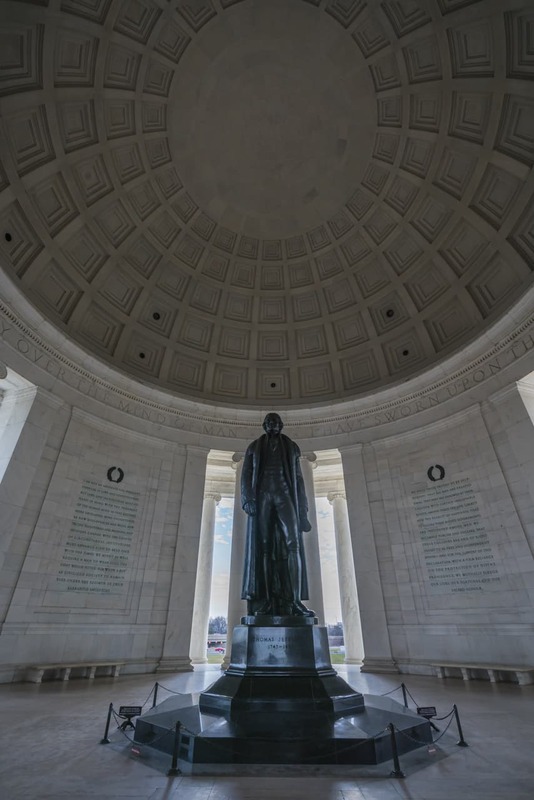 A statue of Jefferson stands tall in the centre surrounded by his most memorable quotes. Few tourists were at the memorial during our visit and we had it all to ourselves walking around the marble steps, enjoying the views and reading the words of one of America's early presidents. Walking west we continued our tour of Washington DC with a stop at the Roosevelt Memorial. We always learn something when we visit a new place. 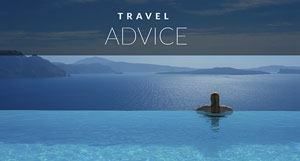 After all, travel is the best education. I must admit, that even though we know the names of many U.S. presidents, we didn't know a lot about each person or their role as leaders. We had no idea that Roosevelt was a four term President. But found out quickly at his memorial as there are four different sections honouring his different terms as leader of the country. He served from 1933 until his death in 1945, running the country during the second world war. It's a very pretty monument that feels more like gardens and a place for quiet contemplation. 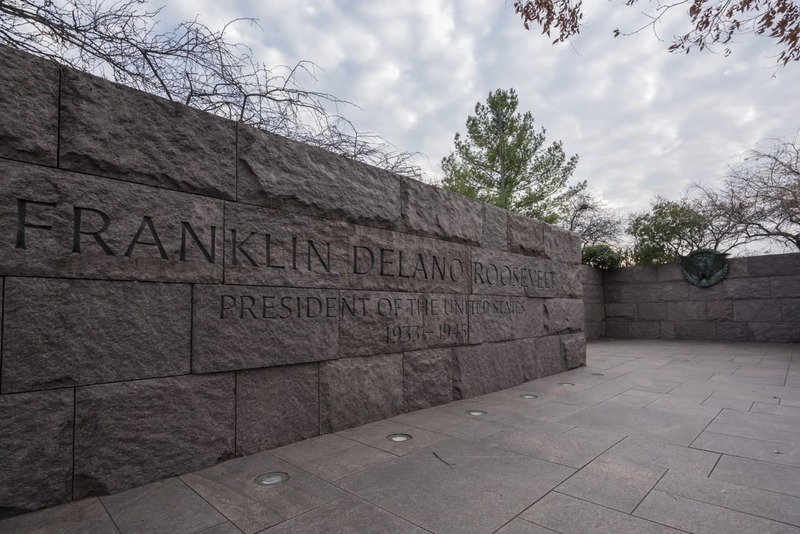 Many of his quotes are etched into rocks, scenes from the Great Depression and WWII are depicted and there are statues of FDR, his dog and Elenor Roosevelt can be viewed as you walk through the four sections. Our next stop on our stroll around the Tidal Basin was the striking Martin Luther King Jr. Memorial. In our opinion this is the most beautiful monument in Washington DC. 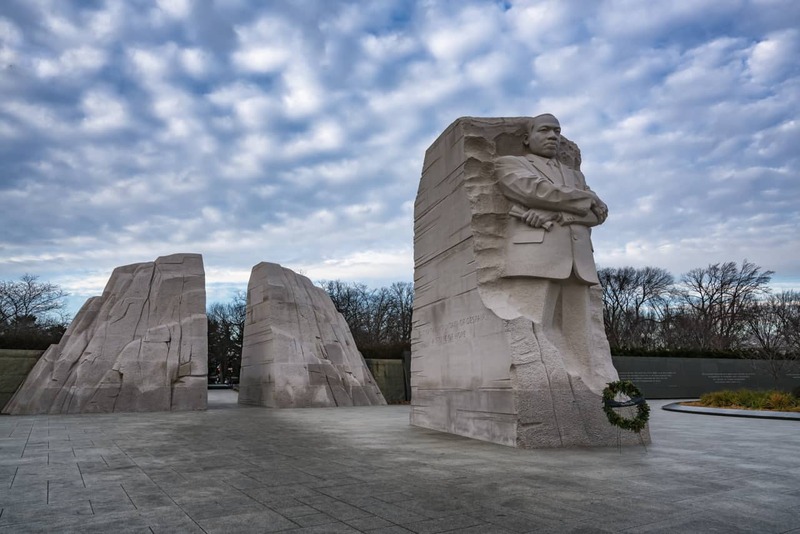 The likeness of Martin Luther King Jr. stands just ahead of two huge slabs of granite signifying the Stone of Hope emerging from the mountain of despair. This monument had a few more tourists honouring Dr. King, but it was still quiet and we had plenty of time to read his many empowering quotes. 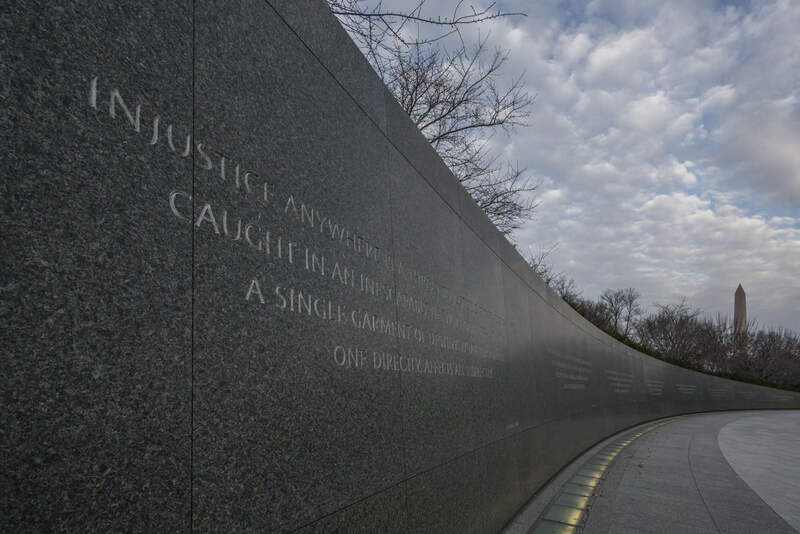 It is a profound experience to read the words of Martin Luther King Jr. etched into a 40 foot (13 metre) wall surrounding the statue. We continued our walk through time moving away from the Tidal Basin towards the reflection pool of the National Mall. There are many monuments and memorials lining the pool that I knew from the movie Forrest Gump where Jenny waded through the water to meet Forrest in an embrace. Our first stop walking from the Martin Luther King memorial was the Korean War Memorial. I didn't even know this memorial existed, but it is a very touching tribute to those who fought in the Korean War. A platoon of men walking in full rain gear, helmets and carrying weapons and radios walk through a recreation of the Korean landscape. The details of each piece of gear was perfection. But what caught my attention was the detail in their faces. I studied the mix of concentration and determination and I found myself mesmerized by the scene. Just a short walk further took us to the Lincoln Memorial, the most famous memorial in all of Washington DC. It was from here that Martin Luther King Jr delivered his famous “I Have a Dream” speech. 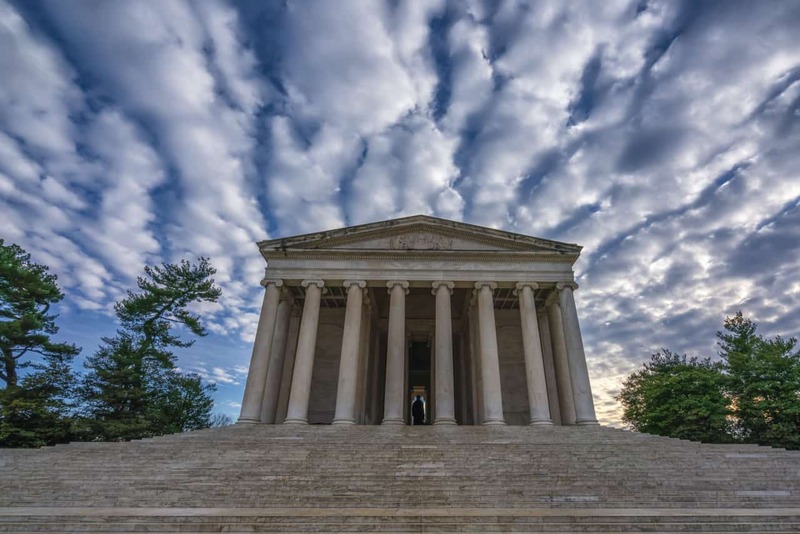 The memorial is certainly awe-inspiring with an imposing sculpture of Lincoln sitting in the centre of a Greek temple complete with white columns and marble steps. 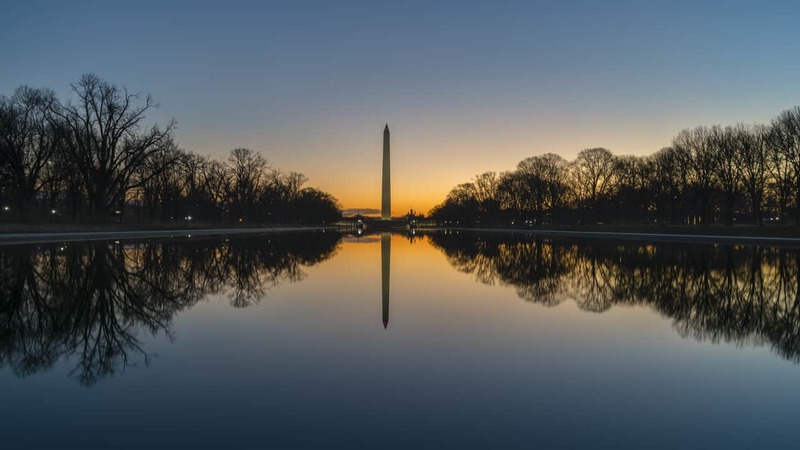 It stands over the reflection pool towards the Washington Monument creating one of the most beautiful settings in the capitol. This was the first stop on our walking tour where we encountered plenty of tourists and we didn't spend too long here deciding to come back the next day for sunrise where we on had the place all to ourselves save for morning joggers finishing up their run at the top of the steps. One could hang out all day at the National Mall taking time to peruse the monuments, relaxing in the park, or simply people watching as you sit on a bench. There are several paths surrounding the mall where runners do their daily workouts and families stroll with their baby carriages. The area is public land and we are told that in the summer you may find a game of touch football taking place outside. I was most interested in seeing the Vietnam Memorial. For some reason this is the memorial that stands out from my childhood. Maybe it was because of all the Vietnam action films that I saw during the 1970s and 80s or it was because I remember the large crowds and media attention it drew when opening. For us, it was the most moving memorial. 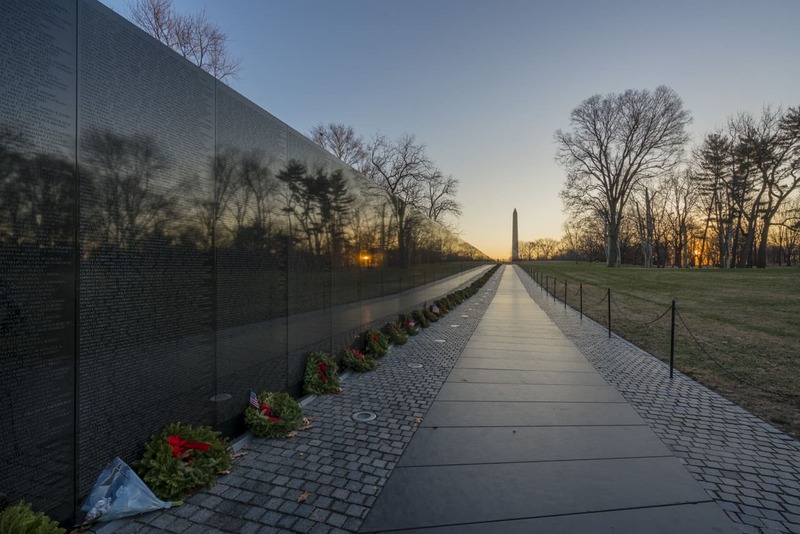 It seems simple in design, but the long black wall reflects the scene where thousands of names are etched into the marble depicting the names of those who fell during the Vietnam War. There is a book where visitors can search each panel by name and rank to pay tribute to the fallen. 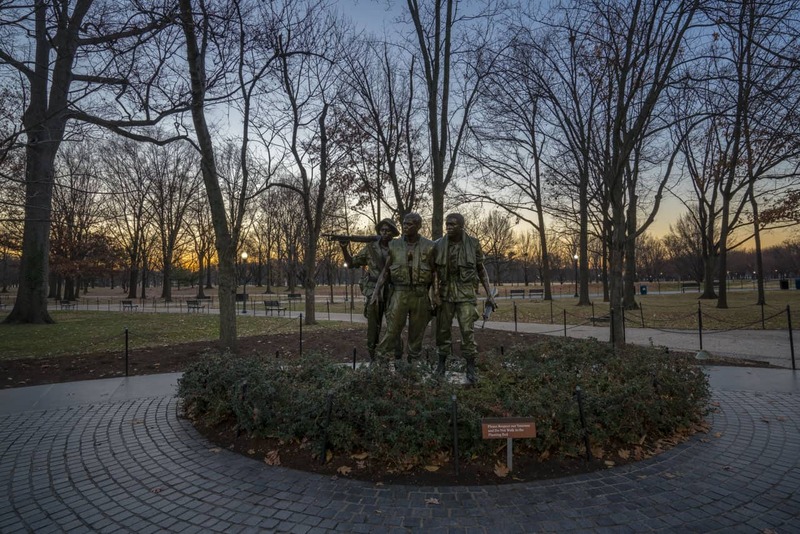 There is a Vietnam Women's Memorial just a short distance away dedicated to the 265,000 women who volunteered to care for the wounded. 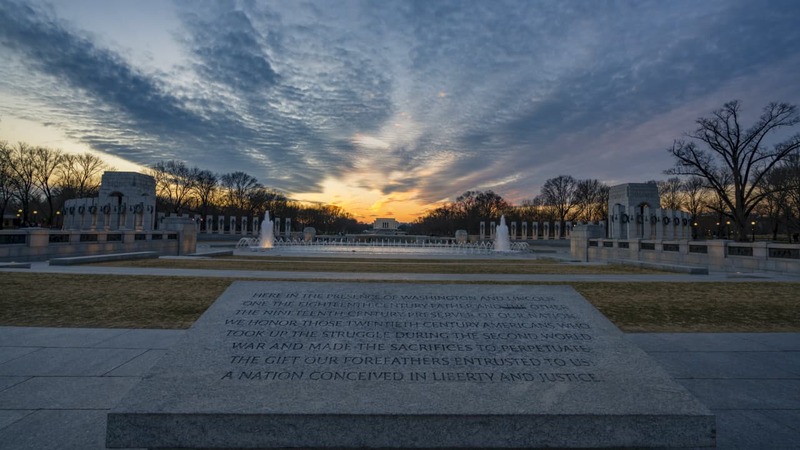 At the other end of the reflection pool from the Lincoln Memorial is the National World War II memorial. The reflection pool is long and the walk from Lincoln to WWII takes a good 5-10 minutes if you go directly from one to another. But you won't want to do that, you'll want to stop to see all the sights in between. I didn't realized just how big this space was. 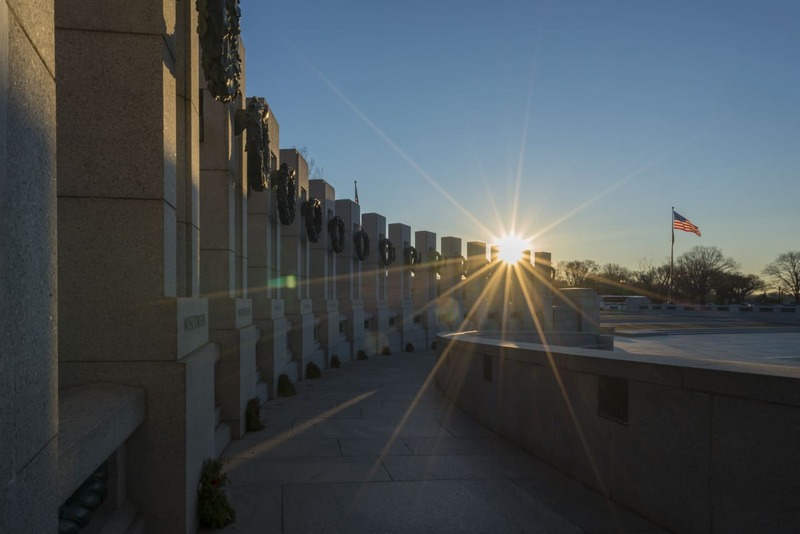 When touring the memorials and monuments of Washington, give yourself time. There are so many stops and it is a massive space. I was surprised to learn that this monument was only completed in 2004. One would have thought that a monument to the more than 400,000 people who died would have gone up long ago. 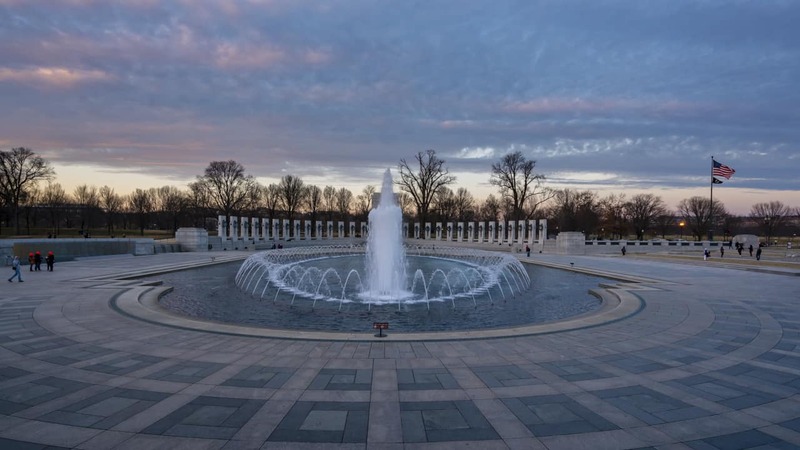 This memorial has 56 columns representing American states and territories surrounding a pool and fountains. There are several places to look out over the fountains. And you will see many people taking photographs from beside their home state. 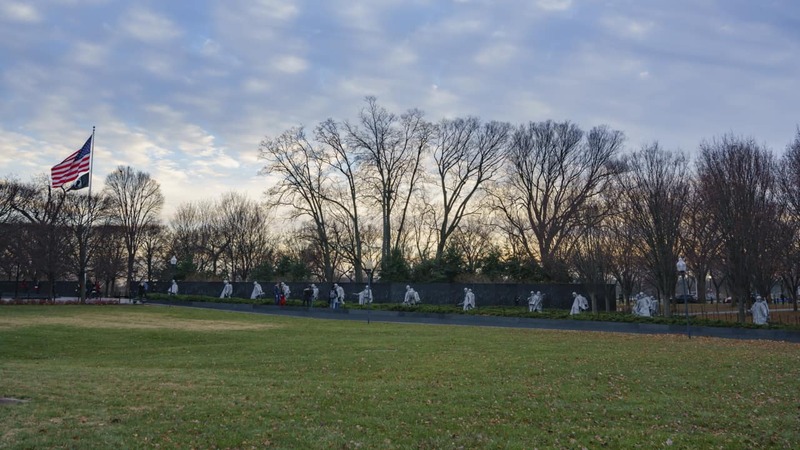 Like many of the other Washington memorials, there are several quotes from U.S Presidents and military figures. 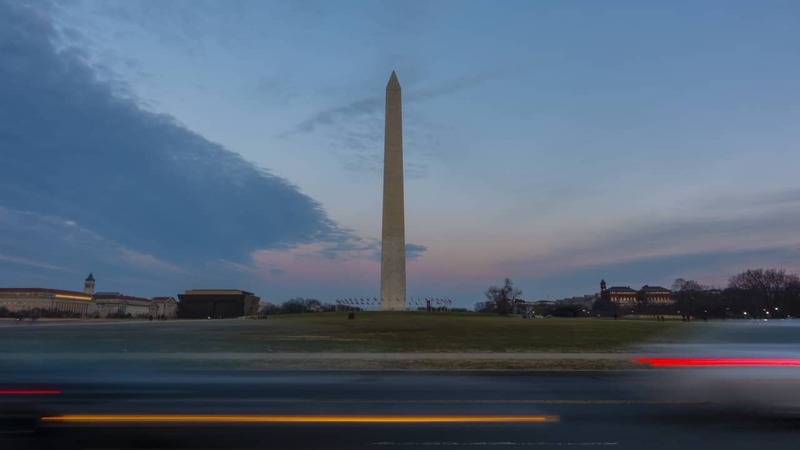 The Washington Monument is most certainly an impressive monument in the city. 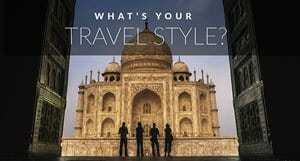 It's not surprising since it is the tallest stone structure in the world and the world's tallest obelisk. It towers above the city and if you need point of reference, chances are you'll be able to see it from wherever you are. It sits in the centre of the National Mall surrounded by open fields. I had always thought that the Washington Monument was dedicated to the city, but now that I've visited D.C., it's obvious that it would of course be dedicated to George Washington. 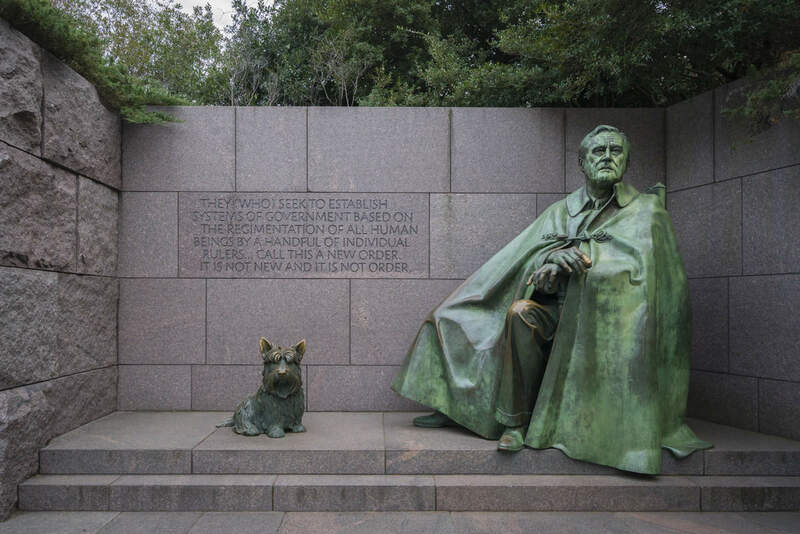 The memorials and monuments of Washington DC are all dedicated to historic figures. It's a little embarrassing to think that I thought otherwise. But not as embarrassing as what I thought about the Smithsonian. 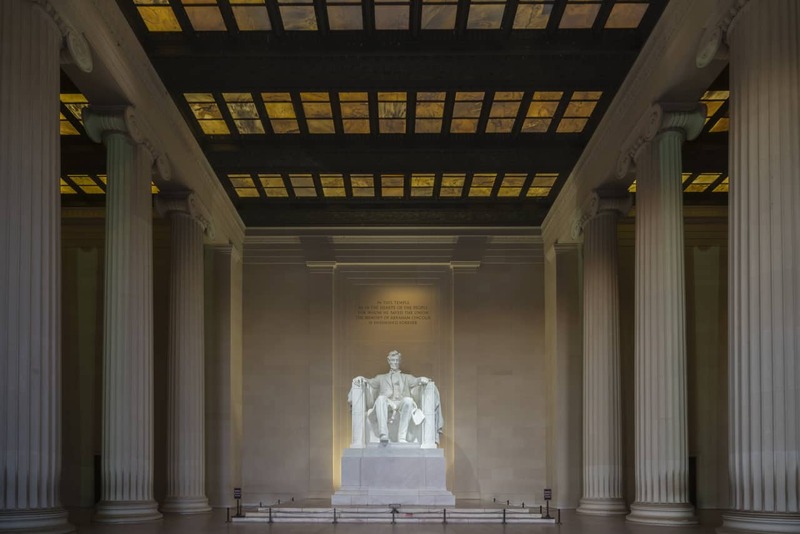 The next stop on our walking tour of DC doesn't go to a specific monument but to what is known as the Smithsonian. 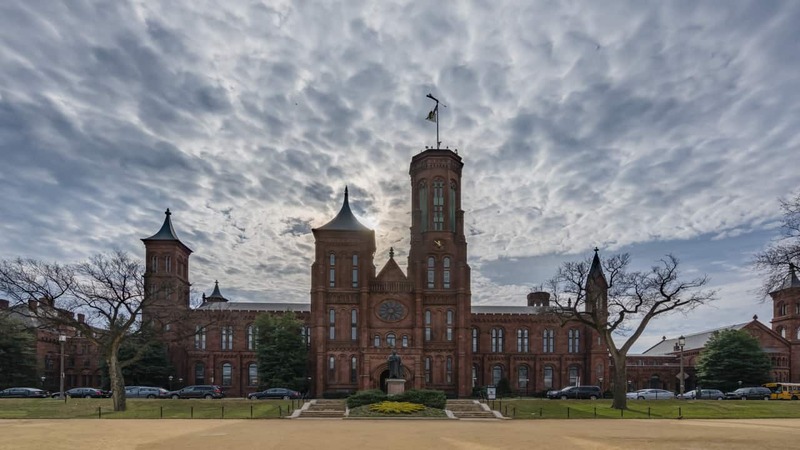 It turns out that the Smithsonian is a complex of 17 incredible free museums located along the edges of the National Mall. 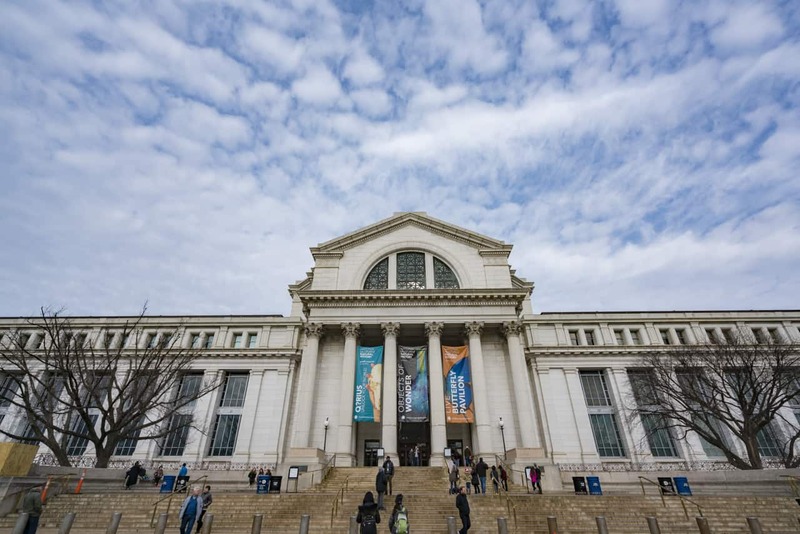 From the African American History and Culture Museum to the National Air and Space Museum, you could spend weeks soaking in the culture, technology, history and art of the Smithsonian museums. There are many museums we didn't get a chance to visit. At first we thought we would pop into as many as we can and see a few things, but taking the advice of our friends Julia and Melanie, we decided to choose three to explore and come back in the future for more. We thought Washington D.C. would be a boring political city filled with uptight suits and uninspired architecture. It turned out to be one of our favourite American cities we've ever visited. There is a lot of history in this town. Many hotels and restaurants date back hundreds of years and bartenders and patrons can tell you stories of when famous Americans frequented these spots and made history. 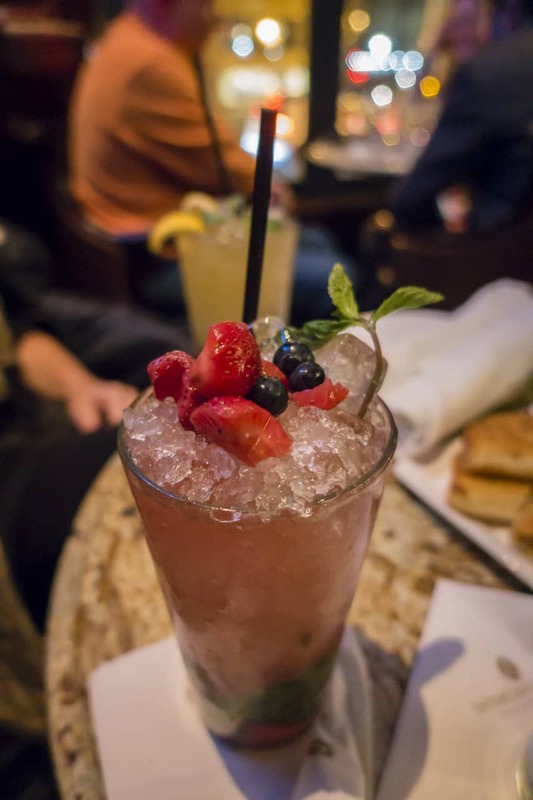 One of our favourites was the Round Robin Bar at InterContinental – The Willard downtown. The Willard was the first hotel in Washington DC and it has hosted every American President (save for the current) throughout history. The Round Robin Bar is a local hot spot for the political elite. We looked around and wondered what political rivals were feeding information to incognito journalists. Oh the people that have past through these doors. Mark Twain, Walt Whitman and Abraham Lincoln have all enjoyed a drink or two within these walls. So many people have been inside, they decided to name drinks after the famous patrons of yesteryear. You can't miss their famous Julieps! 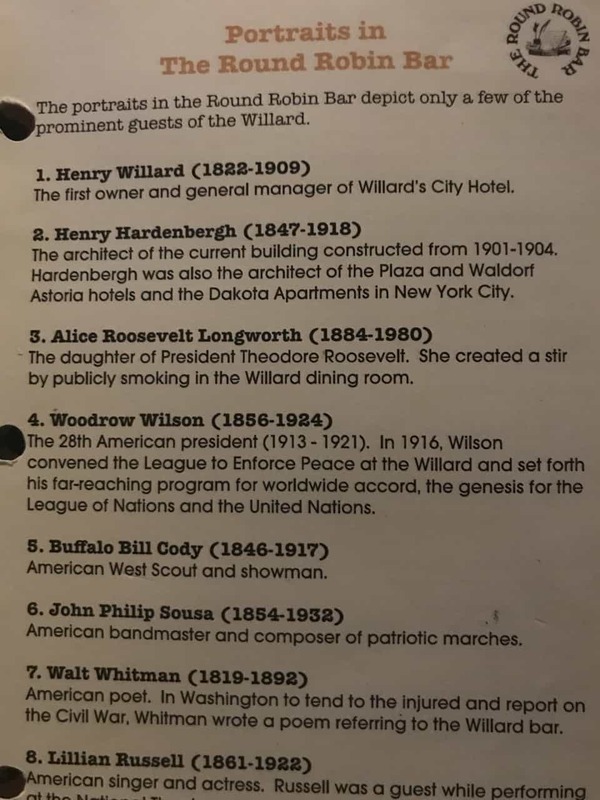 We tried their famous Mint and Christmas Juleps, but you could try a Henry Willard or a Woodrow Wilson, Whatever you decide, make sure to visit The Willard and pop into their mini museum. 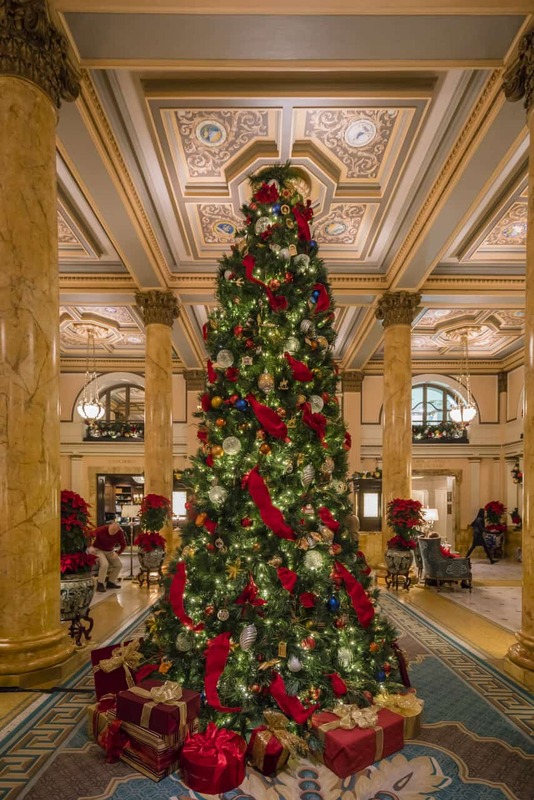 The Willard is the old grand hotel of the city that is a pricier Intercontinental option. 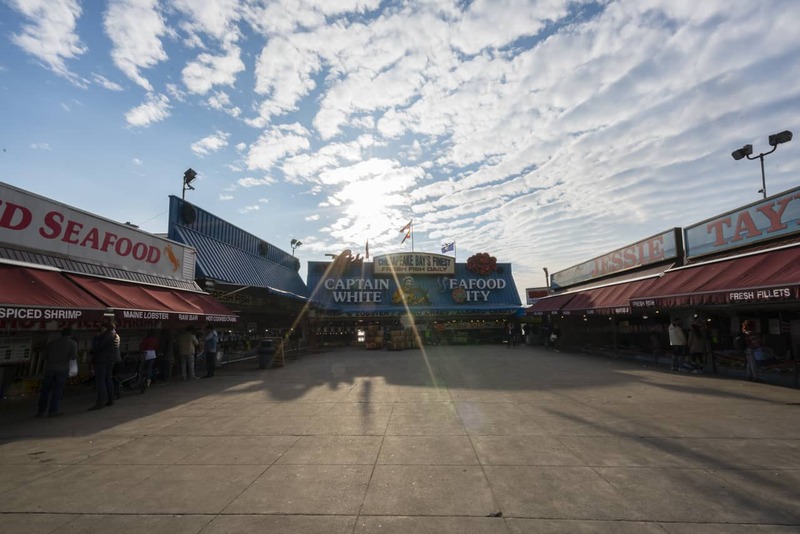 The D.C. Wharf was definitely more our style with the upbeat urban feel. It was young, it was hip and it was brand new. 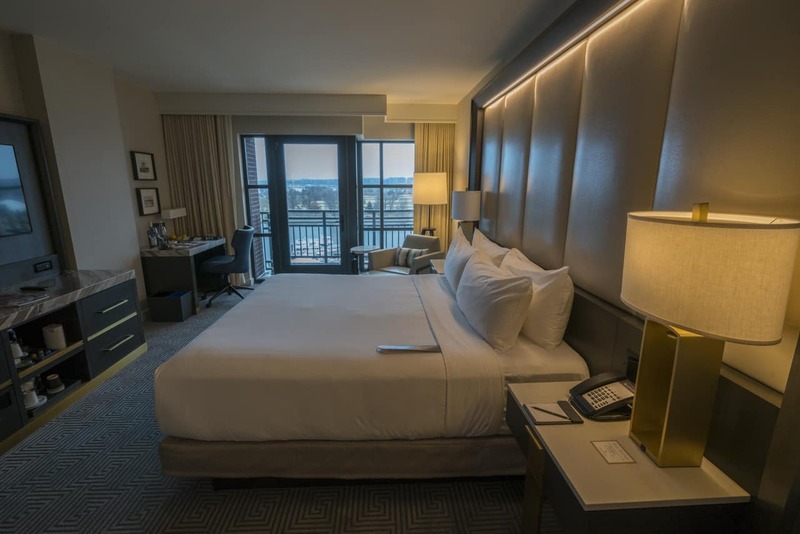 We liked visiting the history of Washington D.C. but it was nice to go back to our upgraded suite (thanks to the Ambassador program) at the trendy new Wharf to relax away from the hustle and bustle. Washington is a must for anyone interested in history but it is also a great city filled with superb food options and a lot of attractions. As a fellow traveller said to us the other day “the people of D.C. work hard, but they play hard too.” You'll always find something to do. Our stays at the Intercontinental D.C. Wharf was made possible by IHG© Rewards Club. To learn more, visit the IHG© Rewards website. 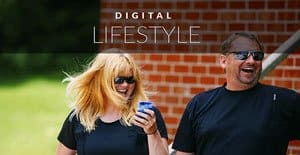 This post is in partnership with IHG Rewards, but as usual, all views of our experience are our own. 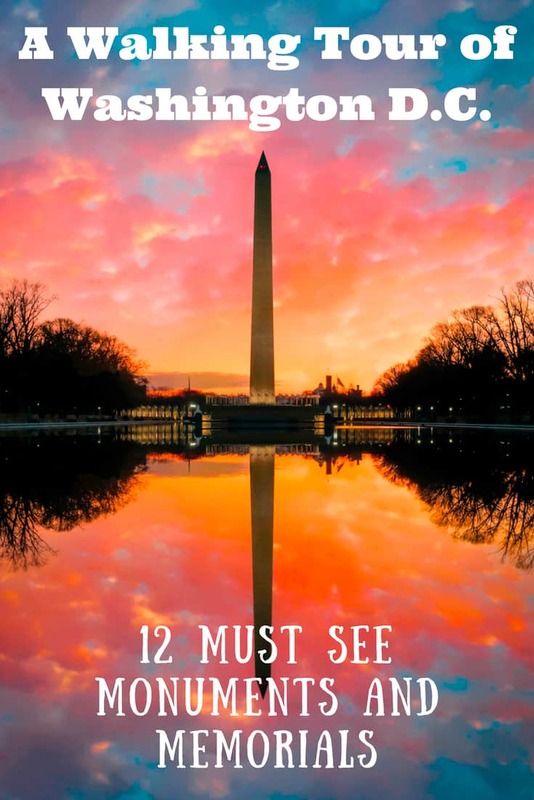 11 Responses to "A Walk in Washington DC – 12 Must See Monuments and Memorials"
We were supposed to visit DC last year but had to cancel. Looking forward to putting it back on the travel list for this year – and this walking tour looks great! The photos are awesome and super cool and eye catching pictures, thanks for sharing this. 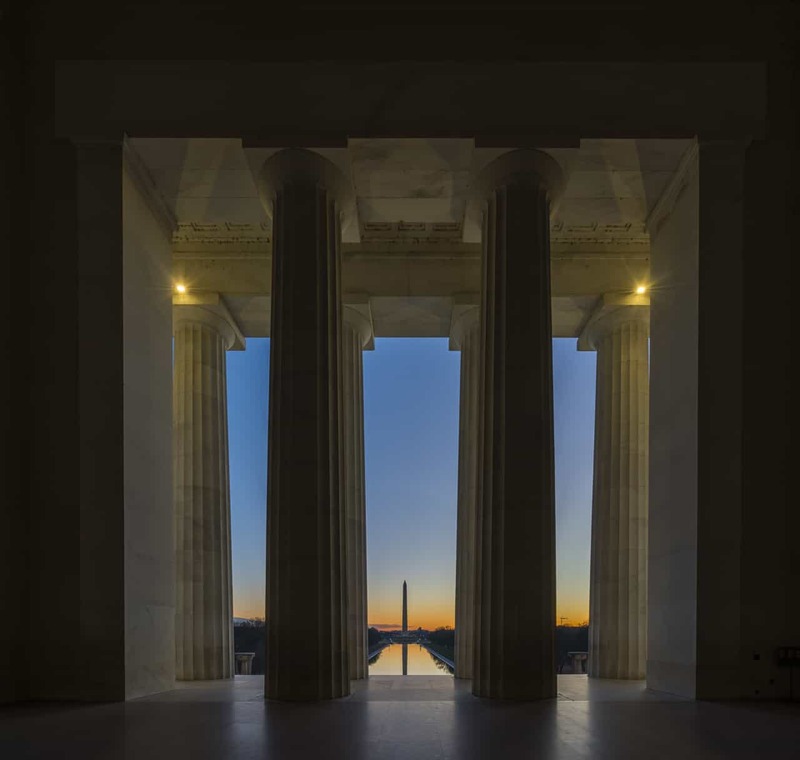 This passage in Wahington must have been cool … the Jefferson Memorial is also one of my favorite places to visit in the city. In this region you will find many historical places full of history. For those who enjoy history, the city is great for this. You show us a historical knowledge and a memorable event through this blog. I am thankful of you for this tremendous information. Such a nice pictures!! This is really fantastic post. Thank you!! Wow those are very beautiful pictures. I just love the clouds and sky. They look so colorful. This is really stunning photographs. I am just impressed by this. Those monuments mean so much and it’s good to see that they are really well kept, litter free and cost nothing. They are taken care of really well and it is nice to see. We were amazed that everything was free. D.C. can be one of the most cost effective trips in the US!